Rarely a day went by in the dizzy 1990s without some well-paid pundit heralding the triumphant arrival of a “New Economy.” According to these financial mavens, an unprecedented technological and organizational revolution had extinguished the threat of recession forever. Though much of the rhetoric sounds ridiculous today, few analysts have explored how the New Economy moment emerged from deep within America’s economic and ideological machinery—instead, they’ve preferred to treat it as an episode of mass delusion. Now, with customary irreverence and acuity, journalist Doug Henwood dissects the New Economy, arguing that the delirious optimism was actually a manic set of variations on ancient themes, all promoted from the highest of places. Claims of New Eras have plenty of historical precedents; in this latest act, our modern mythmakers held that technology would overturn hierarchies, democratizing information and finance and leading inexorably to a virtual social revolution. But, as Henwood vividly demonstrates, the gap between rich and poor has never been so wide, wealth never so concentrated. 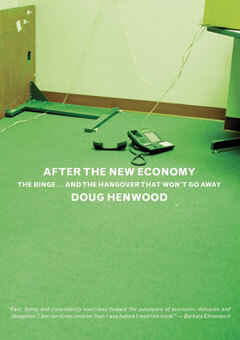 After the New Economy offers an accessible and entertaining account of the less-than-lustrous reality beneath the gloss of the 1990s boom.